Thinking about improving your iPad experience? How about enhancing its protection while carrying it around? 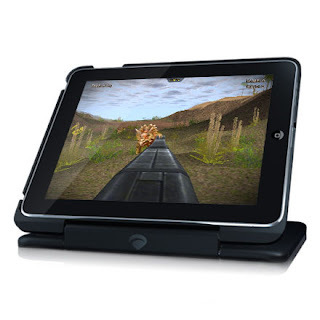 That’s the goal of the Clamcase iPad accessory. The product is an “all-in-one” accessory with a Bluetooth keyboard, case and stand. The Clamcase was announced back in May, and has been released just in time for the Christmas holiday. This iPad case comes with a flip-back keyboard to expose the rubber hinge grip, allowing you to enjoy your iPad in tablet mode. You can also use your iPad in a laptop-like or netbook-like position using the Bluetooth connected keyboard. The Clamcase is a full QWERTY keyboard with 14 function keys. You can use it to email, create messages, update and organize, or search and surf the Internet with ease. The keyboard was designed to include special keys such as HOME, LOCK, SEARCH, SLIDESHOW, VOLUME and MEDIA controls. The Clamcase allows you to use the keyboard when needed, or you can simply flip the keyboard over to enjoy your iPad as a tablet. When you’re ready to type, flip it back. The case also comes with soft 3M pads that cradle all four corners of the iPad screen for protection. The Clamcase is available now for $119, but it is presently going for $99. You can order it from their website.